You may have heard that not so long ago, our Strategic Leadership Team (SLT) was shortlisted for ‘Entrepreneurial Team of the Year’ at the Great British Entrepreneur awards, sponsored by NatWest. Well, a couple of weeks ago was the regional final and although they didn’t come away with the winner’s trophy, they did receive the runner up award – meaning we’re proud as punch with their second place. Out of a whopping 3,000 applications, it was an incredible achievement to simply be shortlisted, but to walk out of Old Trafford with the runners up title has left us as a company further inspired. Innovative – They created a dedicated graduate programme (www.thegradscheme.co.uk) in order to attract young people into the financial services industry. ‘feshnal’ – Ok, so it’s not actually a proper word. It’s their take on the word ‘professional’ which means that they take a professional approach to growing and building a successful business without going entirely ‘corporate’ and losing the fun flair they’re renowned for. Revolutionary – Their vision is to revolutionise the full profession – whether that be their commitment to encouraging fresh talent into financial services, a brand-new approach to compliance (via sister company Apricity) or even the fact that they are an all-female Leadership Team in financial services. Ambitious – Together they have developed and launched a second business, Apricity Compliance. Sister company to Para-Sols, Apricity is a compliance provider designed to support forward-thinking financial advisers / planners in taking a risk-based approach to their compliance and banning the traditional checkbox mentality. 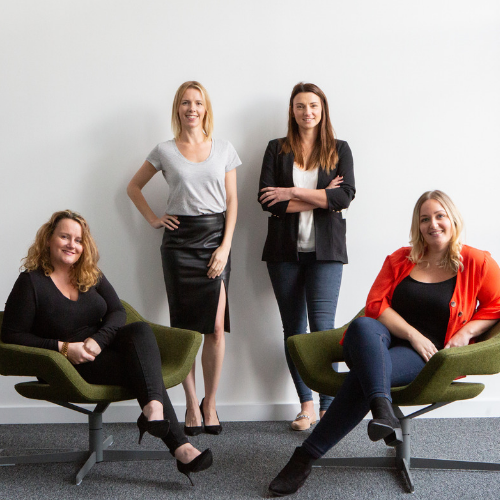 Eclectic – They’re a team of four, each a master in their own arena, who collectively are a perfect blend of knowledge, experience and leadership styles. Cathi – the entrepreneurial one. Jo – the process-driven one. Kim – the target-driven one. Natalie – the emotionally intelligent one. Devoted – What’s a 9-5 working day?! They work in the office. They work from home. They work on trains. They work in cars. And what’s more, they thrive from doing so. Compassionate – They love nothing more than seeing their colleagues grow, both personally and professionally. They prioritise learning development and invest a huge amount of resource to training – from small scale initiatives such as Study Clubs to the creation of a company-wide leadership development programme. Inclusive – They’re advocates for building relationships at all levels and love team building activities as much as the next person. Especially when it involves some social drinks! Appreciative – They know that hard work goes a long way and acknowledge that everyone plays their part in the successes we’ve achieved to date. They’re not strangers to showing their appreciation and often plan staff incentive days, company lunches and just good-old fashioned thank-you cards. We believe that holding these qualities truly makes them gel together as a team and ensures that they run all aspects of the businesses in the way that they do. It was insightful to see what they came up with when discussing these ten words and as a business we were all over the moon that they impressed the judges with the final outcome.